I just had a cracked boiler replaced. I read a lot on this forum and I'm looking for feedback on the final installation. It takes about 18 minutes from a completely cold start for steam to reach the main vents. The timing on both returns is nearly identical. By that time all the radiators are warming up. All the vents have been replaced. Big mouth mains and Gortons on all the radiators. 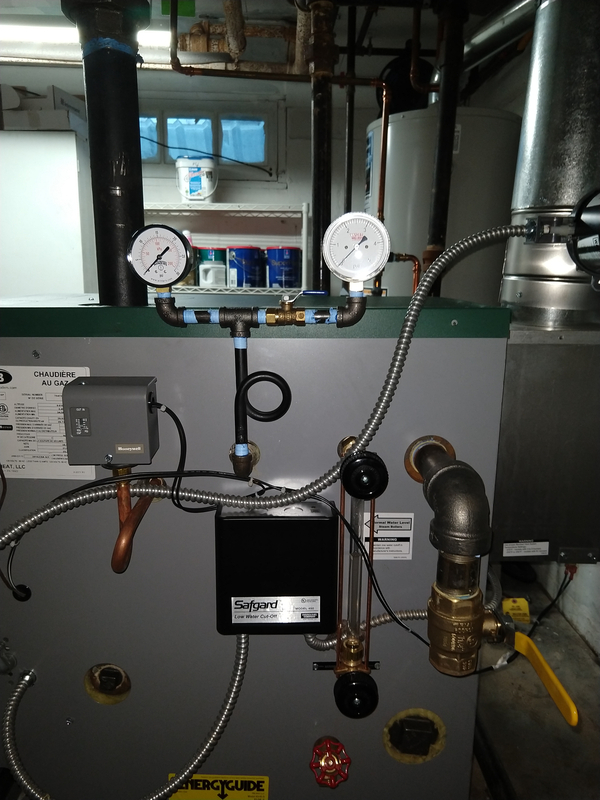 The system won't shut off on pressure and will run until the thermostat is satisfied. I can't even read any pressure on my 5 PSI gauge which I guess is a good thing. How does everything look? Did I miss anything? (Except for the fact that a vaporstat would be better than a pressuretrol, but everything is working so I may or may not address that in the future). With your 0-5psi gauge reading zero all the time I would be you had a blocked pigtail, but I can see it's brand new so I have no idea what's going on there. I mean, low pressure is good, but I'd think you'd see SOME pressure sometime. I would rotate your Big Mouth so that it's supply line is running back toward the main. Otherwise a little water can collect at the elbow. You might notice the horizontal is sloped down toward the vent. You want it to slope so the water goes down the return. It looks good to me, I'll look forward to see what the others say. 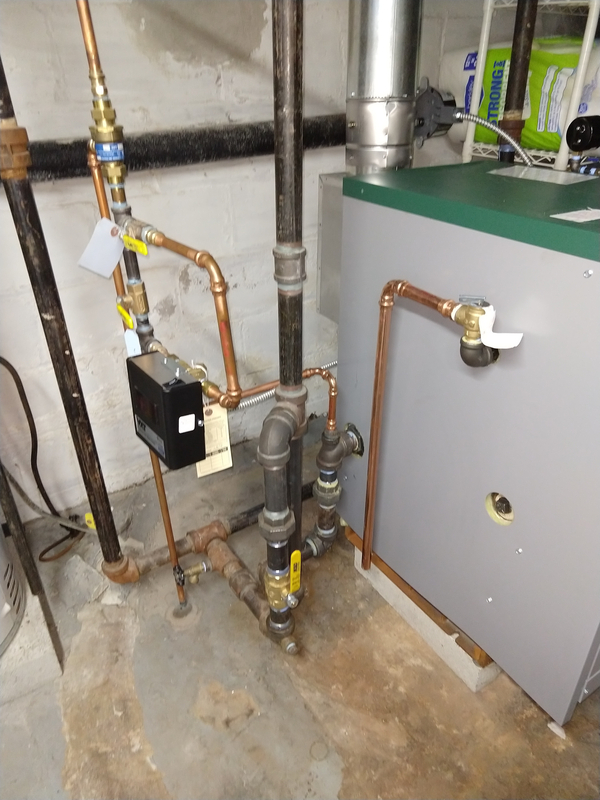 What was your radiated EDR and what is the net EDR of the boiler? Edit: It's a little weird to me that they put the skim valve at the end of the vertical rather than on the horizontal, but maybe they're going to pull all that off after they are done skimming. 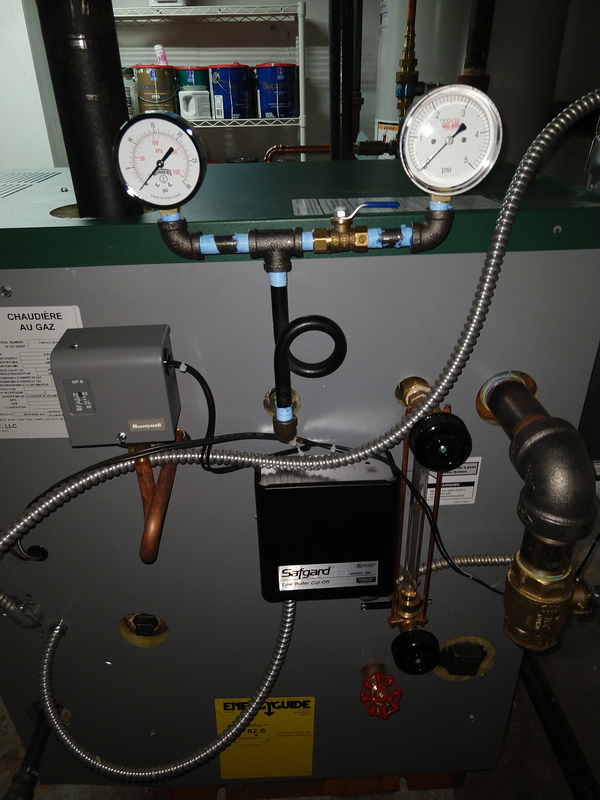 The zero reading is fine on the gage as long as the system is heating and running, - 0 - psi is a good thing. You probably will not need a vaporstat. One thing: once a riser turns horizontal going towards the header, it should be pitched slightly downward towards the equalizer. 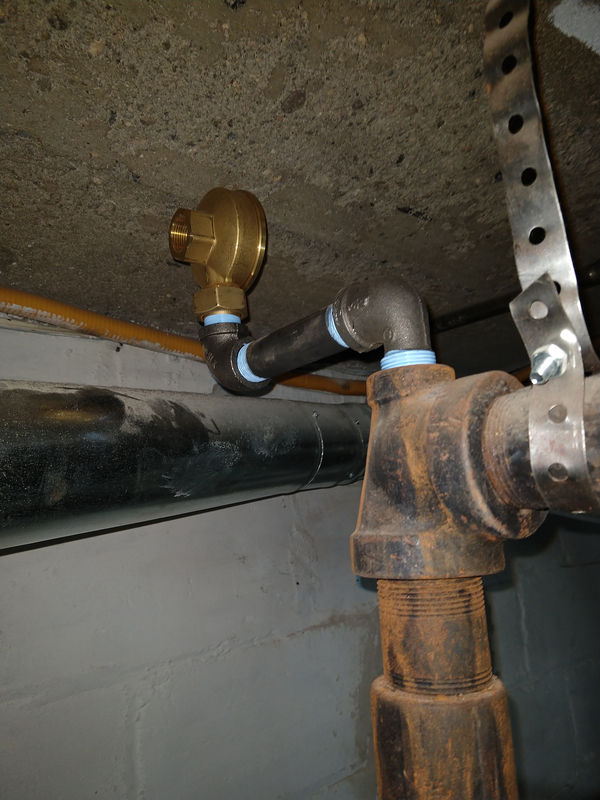 The way it is now, you may get some water hammer. 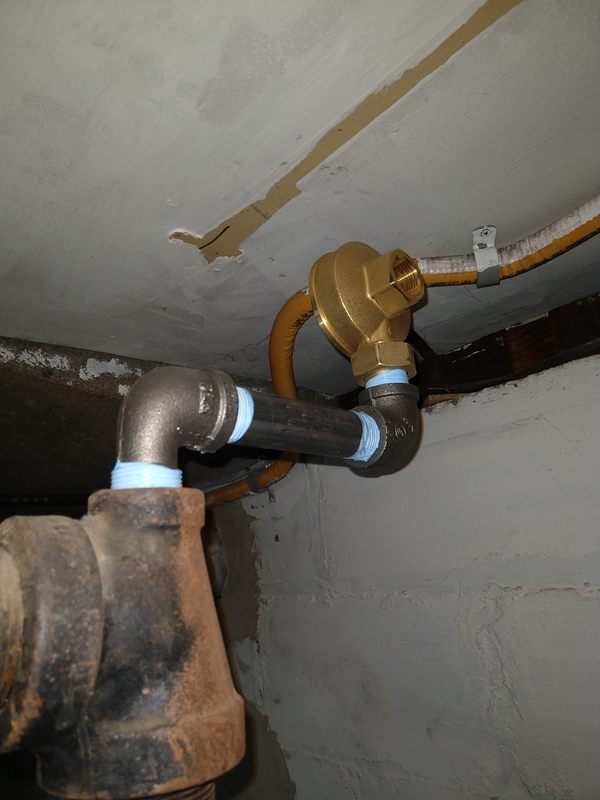 Are the pipe sizes right from the installation manual? Looks like nice work. Thanks for the feedback everyone this is why I love this form. @ethicalpaul thanks for finding my mistake on the main valves, I fixed it and the condensate will now run down the way it's supposed to. That was an awesome catch because they were already filling with water! That's how they left the skim valve but I guess it's okay the way it is easy to put a bucket right underneath. 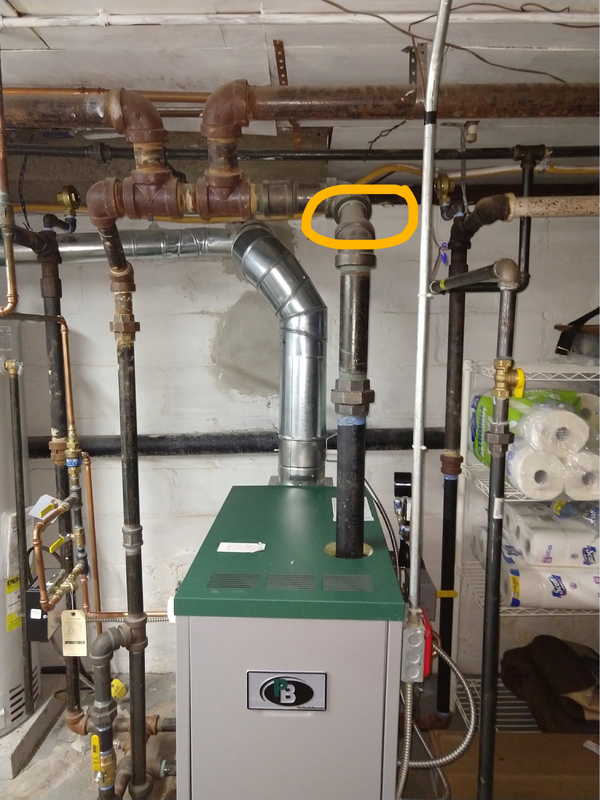 I don't have the EDR numbers but my contractor who did the main boiler install measured all the radiators, and he came out with the same size boiler that it replaced. I also double checked the gauges again everything is clean and with everything disconnected there is steam that comes out of that port so I think I'm just lucky and it's running at a super low pressure. @Ironman thanks for the tip on the piping I'm not getting any water hammering so that's good. @nicholas bonham-carter the pipe sizes are correct per the manual. What you see is actually a bunch of paper towels. I'm debating whether to insulate. 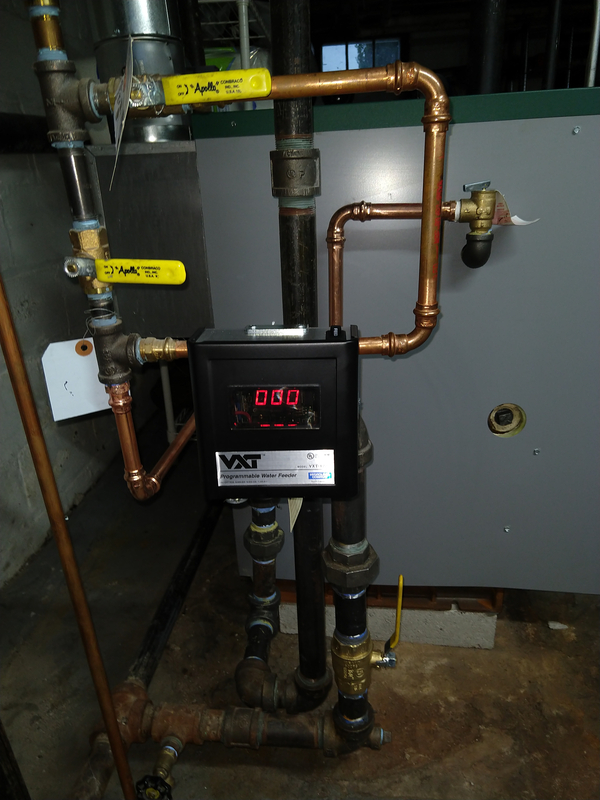 I know I'm getting a ton of heat loss but everything is working great even still, and I don't have any other heating in the basement so I need to weigh the cost of adding some versus insulating the pipes. 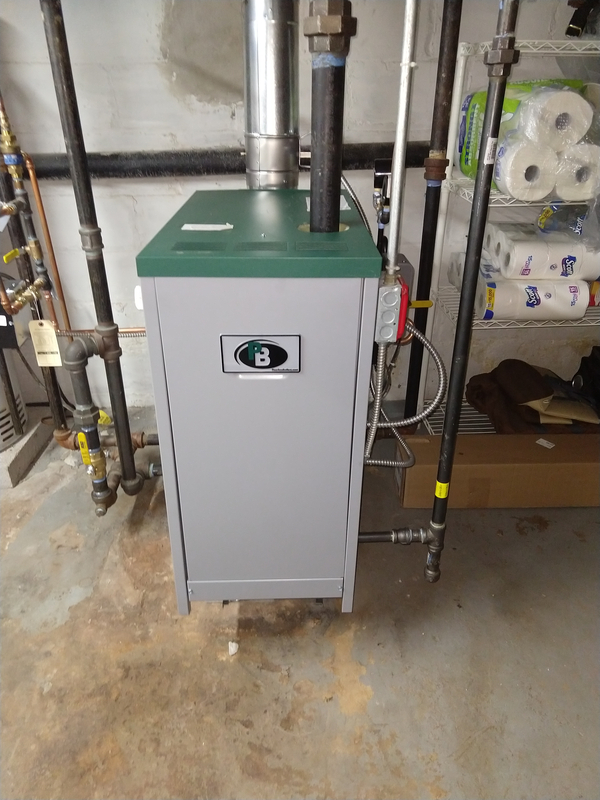 Did the safeguard come with the boiler or did installer replace? I thought that Peerless came with cyclegard. Just curious. The pros here will tell you: if you need heat in the basement, then add it--don't use the mains as your radiators because it harms the performance of your system overall too much. And it's good if they leave the skim stuff there for you...I was just wondering why they didn't put the valve on the horizontal to keep water from pooling in the vertical part. @STEAM DOCTOR the boiler it replaced wasn't very old so I had them put the new boiler in and keep all the old controls knowing I was going to replace them. I replaced the cyclegard with the safeguard myself and also replace the old water feeder with the metering one. They discounted the install since I didn't use new controls. I know it shouldn't bother me but I keep going back to the fact that maybe I should be seeing some pressure on the gauge. Did I install the pigtail correctly? I'm pretty sure I got the one for vertical use. And again I took everything apart and there's no gunk in the port, and I do see steam coming out of the port with everything off. It's really only bothering me because I like to know when something is wrong which is why I put that gauge in. I guess if the system is really operating at such a low pressure that the gauge won't register I can assume something is wrong or something happened if I start seeing pressure on the gauge. @nicholas bonham-carter I should have known better. I guess I figured it does really look like thick wall fiberglass insulation from that angle. Although maybe a little too thick..
NBC, Scottie pipe insulation, asbestos free and no itching. My grandparents built a house about 100 years ago, they insulated the walls with newspaper and copies of the "Nebraska Farmer" magazines. Really interesting reading when it was remodeled. If I wanted to purchase a vaporstat what model should I be looking at? 0-4 psi? This guy? Black is ok if you make sure to check them yearly. Nice looking job, No issues No nitpicking. Do not waste money on a vaporstat. Waste of money for your job. 18 min from a dead cold start I would say is fine. 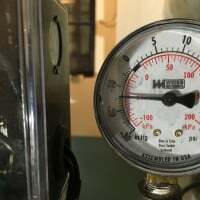 If you aren't building any pressure as indicated by the gauge, I am of the opinion a vaporstat is a waste, and this is coming from someone with 2 of them. All you do is shift the scale lower and still not cut out on pressure, so why bother spending the money? 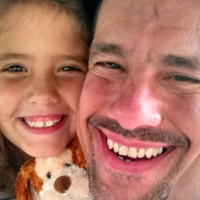 @EBEBRATT-Ed @KC_Jones thanks for the feedback. I guess in my case there is really no way to ever test the pressuretrol until I have a problem? My gauge doesn't show anything till the very end of the heating cycle either & even then it is about 1/4 lb of pressure. I wouldn't worry about it! My radiator valves are super old so I was hoping to not mess with them and replace them little by little. I guess for now I'll be happy everything seems to be working great.